Bali to Gili Meno, The travelers are often confused with the question how to reach gili meno from Bali, when they really want to visit this island. Gili Meno is a small island located between Gili Trawangan and Gili Air. The easy way to go from Bali to Gili Meno or return is by taking the fast boat from Bali to Gili Trawangan, Gili Air or Lombok, then taking a private hopping boat or public hopping boat to reach Gili Meno. On the return way, you need to take a hopping boat (either charter or public) from Gili Meno to Gili Trawangan or Lombok and take the fast boat to Bali. 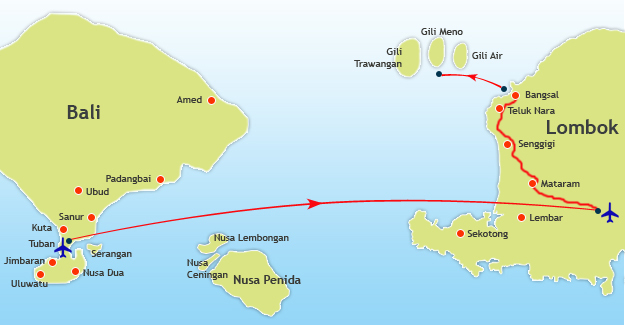 There is no fast boat goes direct to/from Gili Meno. The travelers should take a smaller boat upon arrival of fast boat trip. Note that the public boats to Gili Meno have few daily schedule. The ticket fare for public boat is IDR 15.000 per person. The cost for private boat is vary around IDR 200.000 – 350.000 per boat. From the explanation above, we always offer the convenience way to the travelers, especially who book the fast boat through lombokfastboats.com. You can book a fast boat and charter boat simply, so that when the fast boat landing in Gili Trawangan or Lombok, our team is ready to pick you and drop you to Gili Meno. You will save your time because you don’t need to find a public boat / charter boat. You can save the money because we offer charter boat cheaper than publish. If you need this transfer, please contact us.